People either love George Foreman Grills or they don’t. When they started out they really did revolutionize indoor grilling. But in recent times, some including myself have drew attention to the fact that they’re playing things rather safe. No risks, no wow factor. But others point out that they do make reliable, durable grills that do the job most people need them for which is to create tasty meals in a short time. This is true and so I was interested that after in my mind, a few years in the wilderness Foreman finally seemed to have something that broke new boundary’s. 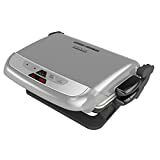 Enter the George Foreman GRP4842P Multi-Plate Evolve Grill with Ceramic Grilling Plates and Waffle Plates, Platinum. I wanted to know if the claims where true. Does it Grill almost anything? Is it easy to use? Does it represent another great leap forward? And, is the price right? I looked and here’s what I found. In terms of shape and size it sure looks like a Foreman. You get the large Lid stretching itself over the smaller base. There’s also the typical Foreman hinges and Removable Drip Tray. But it’s not black. Foremans are typically Black and shiny. The Lid here is a shiny Silver you can see your face in. A tiny change, but I did wonder whether this was a sign that Foreman really did have different intentions in this model. Then you’ve got more Foreman hallmarks. It’s well-built and durable. This is reflected in the weight of 15.5 pounds which is heavy for a portable. The measurements too are typical Foreman. 15.5x9x13.5 inches. This is around their normal parameters. So it’s a fare design, that will last a long time and we’ll see in the performance section as to whether that Silver Lid was Emblematic of a new direction for the company. As with most Foreman’s you don’t have to do much in terms of assembly. This model comes basically assembled. You have to push in the Grates and roll up the Drip Pan but this is a five-minute job. Good start. You get a reasonable size cooking area. Not outstandingly large but you can put five burgers on here without squeezing them up against each other and pressuring down the Lid. It’s designed to cook five servings and it does that. But, it should be noted that this means five items, not five meals. If you want to have Vegetables with your Burgers or toast their Buns then you’ll need to Grill twice, or use another appliance. Interesting. Let’s talk about the Grill Grates in more detail. Foreman isn’t known for their Grill Grates. Grates aren’t as important in electric grilling because they use heating elements rather than flames. So, evenly cooked food is a virtual guarantee from the outset. Given this fact, you usually get pretty simple straightforward no thrills Grates. But here they’ve thrown in Ceramic Grates. Ceramics are tougher and provide more insulation than Cast-Iron. They also heat up quicker for faster cook times and hold heat longer. Ceramics are less intrusive and therefore less likely to break the surface of meats, so meats hold in their juices better. The Ceramics used here are pretty darn good and the meals you get out of this Grill Plate, bear all the hallmarks of beautiful Ceramic Cooking. I was very impressed. It’s huge and it’s slap bang in the middle on your Lid. A massive button with the word ‘Sear’ written on it. The problem is that although Foreman has broadcast this feature as a better more effective way to Sear meat, it turns out to be a non-entity. When you hit that button the Grill turns its heat up to 500 degrees and Sears meat. The problem is you can Sear meat 450 degrees and most people cook burgers and Steaks at around that temperature anyway. So there’s no reason to hit the button. This is a let down compared to those wonderful outstanding Grates. My advice is to forget about the button because with those Grates and 450 degrees heat you’re already creating phenomenal Steaks and Burgers. Foreman estimate that foods cooked on this will be 42% healthier. That’s based on the idea that you don’t need extra grease because of the non-stick surface. And also that the sloped Grates drain of much of the fat in foods. I can’t comment on the accuracy of this 42% figure, but a lot of grease does end up in the Tray and no extra Grease is required. Also, the use of Ceramic Grates means PH Levels in foods are balanced and juices are intact. So roughly accurate. Cleaning is easy as with most indoor grills because they Porcelain-Enamelled the entire cooking surface. It’s a five-minute job and it goes like this. Remove the Grates, boil a Kettle, set them slanted in the sink and pour the boiling water on them. Food and other debris should just fall away. Give them a little wipe and slot them back in. Don’t submerge in water at any time and don’t get too much water in the base. This is a 3 in 1 so you can adjust the Hinges depending on how fast you want food to cook and what type of results you want. A tight Lid produces insulated Ceramic grilling with sear marks and fast cook times. A gap lets air in so cooking is slower but for medium rare you want that. You can also flatten the unit by loosening the Hinges for Panini’s and Toasted Sandwiches, which this does rather well. It’s doesn’t burn as I’ve experienced with other models. It’s non-stick but Waffles are average. Not great. This is not something you’ll create restaurant standard Waffles on but it is reasonably good. And it’s easy. You just pull out the Grill plate and slot in the Waffle Plate. Here’s my issue. Foreman should have been pointing out the fact that you can do amazing Pancakes and Eggs on this with it being flat. Pancakes and Egg’s are wonderful and you can’t do those on most other Indoor grills because of sloped surfaces. These are the big selling point here. Not the imperfect Waffles. The flat surface means you can cook almost anything on this and there’s lots of room for experimentation. It is somewhat of a breakthrough for George Foreman. The Ceramic Grates are a real step up in terms of quality of taste compared to other models available. You get some of the best-grilled food out there; certainly in indoor grilling. The Hinges are also good, allowing you to lay this model flat to make Sandwiches, Paninis, and Eggs by inserting the Waffle Plate. there are no limits to what you could make on this. It could have had a bigger cooking area and the Searing button didn’t really work out though. The health benefits are also debatable, certainly at Foreman’s 42% figure. But, it’s going to be great for families who want to make breakfast as well as dinner on their Grill. And, it’s easy to clean, plus there’s no assembly. They didn’t go where no man has gone before, but as far as taste and variety goes, they did something better when they got there. Thank you for reading.